I was born in a farmer’s family in Champaran. And it was in the farmlands that I learnt to both walk and talk. Khet and Khalihaan became my first school. I migrated early. To boarding school, the Sainik School at Tilaiya. Then I enrolled myself for a Physics honours undergraduate course at Delhi University. But I soon gave up to come back to my village. To take up farming, like my forefathers. The year was 1970. Yet I dreamed. And, one fine morning two years later, I left to pursue my dreams : Fine Arts and eventually films . I left home with Rs.300 in my pocket. I trained as a film editor at the Film and Television Institute of India at Pune. In my film making career, my social and political intervention has been through films like DAMUL, MRITYUDAND, GANGAAJAL, APAHARAN and now RAJNEETI, in the making. But if films were the dreams that I chased, I remained rooted to reality: to my roots. And there remained a yearning elsewhere in my heart. It was stuck in my roots : my beloved Champaran. It bled during British times till Mahatma Gandhi bought redemption. But after that? Poverty, unemployment, unrenumerative agriculture…..infact, darkness all around. A darkness which perhaps made my parents name me PRAKASH- LIGHT. A darkness that kept haunting me. A darkness Champaran must get rid of. I never really did leave Champaran. My pursuits gave me strength and inspiration. The resolve within grew stronger. GANGAAJAL was politically opposed. The political turbulence at its release – due to the coincidence of a character being named SADHU YADAV- made me feel that making movies was just not enough. I decided to intervene both socially and politically. GANGAAJAL thus became a turning point. A two-lane pathway crystallized within to shed Champaran of its darkness : The first, SOCIAL: through self-help, social work and entrepreneurial intervention. The second, POLITICAL: on people’s strength, their mandate. Hundreds of non-resident Biharis have shared their angst at Bihar’s suffering from New York to New Delhi. Believe me, each one of them wants to lift our land to its rightful place under the sun. There has never been any doubt about its potential. But how many, if any, can find the time or courage to stick their neck out? Failure is a deterrent. I have chosen it as a challenge. I contested the 2004 parliamentary polls as an Independent from Bettiah, my home. I lost. Yet, I won. My conviction grew stronger. Perhaps, I needed to instill confidence in my own people that we could together change the face of Champaran. But where to begin? We chose the dismal sphere of medicare. From being inevitable mortuaries, Bettiah’s M JK hospital and Motihari’s Sadar hospital are today actually life saving institutions. My people and I together made this possible. Floods and Fire, Champaran’s -in fact Bihar’s- perennial sorrow. The usual cries of apathy. WE, together, made solace possible. Last monsoon, the Kosi brought unprecedented devastation. WE rushed and set up a camp for over 6000 people and together with the survivors created a campus of 800 huts, hospital, school, a temple and a mosque. We ran it for 6 months. The Kosi region is my land too. I am a son of Champaran. Also of Bihar. Together, WE can make it turn around. Champaran, the sugar bowl, turned a bitter land over the last decades. Mills closed. Farmers became poorer and poorer. I decided to lead by example, by setting up our own sugar complex. My people volunteered with their land. The mill’s construction is now finally underway after the long delay in obtaining clearances. Red tape can both delay and derail development initiatives. A political mandate can help overcome such obstacles. It can expedite delivery of services. So here I am, once again amongst my own people. The purpose to become a member of Parliament is to achieve a legitimate position to have access to resources: Resources that I can bring to Champaran for its development. The passage of time since the 2004 polls has helped clear doubts and apprehensions. The love that is overwhelming me in village after village is humbling. It is also inspiring in is message : WE SHALL OVERCOME! Ironically, if GANGAAJAL became a turning point with my reel character SADHU YADAV, it has brought me and the Real SADHU YADAV at the crossroads of the hustings on my own home turf : West Champaran (Bettiah). I can only sympathise with the real SADHU. He has lost his party and its flag. He has also lost his constituency and has had to cross over to mine. The Congress has adopted him and he hopes that West Champaran too will do the same. I can only wish him well. 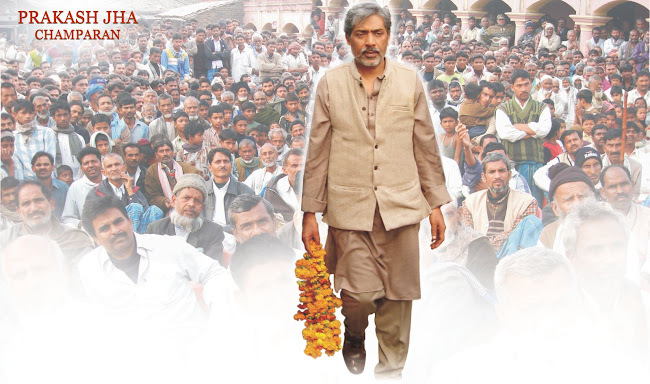 The spoilsport at GANGAAJAL’s release will find a sporting Prakash Jha in real arena of electoral RAJNEETI. While I wish Sadhu a happy tour of West Champaran, my best wishes also go out to Sanjay Jaiswal, the young doctor on the Lotus symbol. Sanjay has recently returned from his tour of the RJD. Sanjay has been very enterprising in his electoral pursuit. After his late father, Dr Madan Prasad Jaiswal, lost the 2004 polls after a three term stint in the Lok Sabha on the BJP ticket, Sanjay’s political aspirations emerged. Denied the BJP ticket in the 2005 assembly polls, he pulled his staunch Sangh Parivar father to the RJD and got himself the lantern symbol. To lose. I offer my condolences to Sanjay and his family on losing his father recently. And I wish his political career well. A man on mission...makes the difference...Ultimately. The write up shows that though Prakash did his share of struggle outside the state and his heartland Bettiah, he was always emptionally rooted there...I am convinced this man would bring the real change..initiated 92 years ago by Mahatma Gandhi...Good Luck!!! The reel man of entrainment (making social movies) has jumped to war as real character. As an Educated person, you have Earned respect from core sector, Enough money to live a decent life. Still, you have decided to get into "dirty" active politics to clean it and use for right source and resource to address problem of people in your motherland - West Champaran, Bihar. You have taken a right decision. I am sure & confident that you will WIN. You have become an inspiration leader for educated and entrepreneurs. All the Best!!! God Bless you. Sir,hats off to you as a person and as a Filmmaker,but not as a politician. I was firmly with you before you contested LS polls 2009. You did great for the people of Champaran,but I think you cashed on the faults of the RJd government,if I am right,because theoretically it is almost impossible to prove any politician wrong. You earned a lot of name and fame by helping the people.But Ithink that the poor condition of Hospitals,Roads and everything else was a great gift of 15 years of RJD 'Raaj'.So,why it became a question of life for you to hold their flags high. And we were expecting a leader in you but unfortunately you did the same what others does. And this is the duty of everyone to do a bit for the sake of the people according to their capacity,You do your part,thats the great thing,others doesn't thats bad. But by standing with Shri Lallo Yadaw,what message is given to the common man?????? If possible please make it clear,if you think it to. you can mail me personally at invacations@gmail.com too. I would have never posted my comments to any politician,I post it to you,because I do think you care for the public opinions. Wishing all the best for the polls. from different dealerships. When we hire a banquet hall for a party, the space in the banquet hall is hired to hold the party. Your article has truly peaked my interest. I'm going to bookmark your website and keep checking for new details about once per week. I opted in for your Feed too. May I just say what a relief to discover somebody that actually understands what they are talking about over the internet. understand this side of your story. I can't believe you aren't more popular because you surely possess the gift. innovative cellulite treatment available now: cryotherapy.